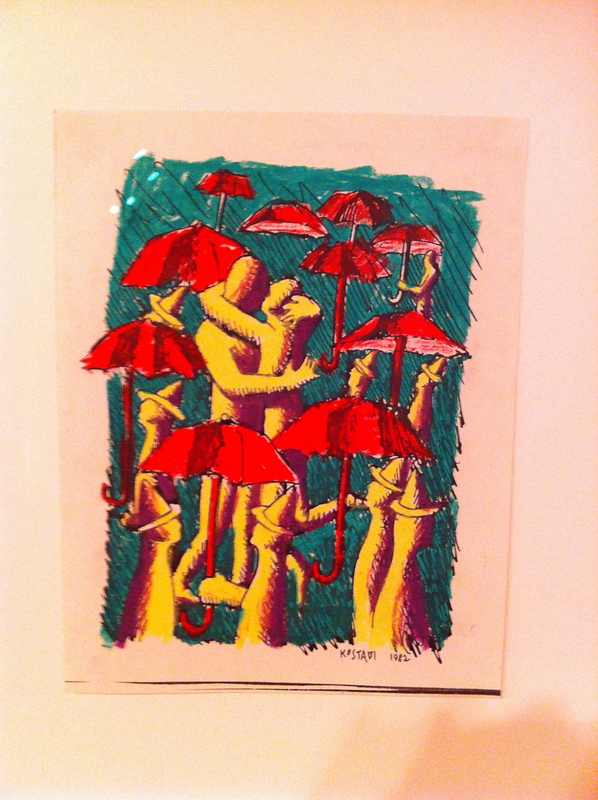 I couldn’t help but chuckle when I went to MOCA yesterday to see the Herb and Dorothy Vogel “50 Works for 50 States” collection and came across the above piece by Mark Kostabi. It’s been a few months since we’ve had some consternation-induced MOCA news, and just when you think you’ve let just enough time go by without some MOCA drama something will always jump off to get us all in a titter. All hell broke loose Thursday as the L.A. Times dropped a buzz worthy exclusive bomb that sent reactions flying on Twitter, and the media. We usually only get this excited over celebrity marriages, not institutional ones. The Los Angeles County Museum of Art, in response to a RFP of sorts from MOCA trustees, proposed a merger between the two museums. The overture was not unprecedented, as MOCA went down this road with LACMA in 2008, and at the time in lieu of succumbing to acquisition, Eli Broad infused the institution with a $30M investment (or a conditional matching gift) with the hope that the museum could continue to remain independent and true to it’s original mission. The mini-melodrama that preceded this failed 2008 merger led to some stings and bruised egos when in the same year Broad pledged $50M to build a contemporary wing at LACMA. BCAM was supposed to house much of Broad’s personal collection currently held in Santa Monica. Instead, on the eve of the grand opening of BCAM in 2008, Broad announced that only a fraction of his collection would be showcased there and the negotiations went off the rails. All of this eventually led to Broad breaking ground and building his own contemporary museum downtown, across the street from MOCA (to be completed in 2014). So when Michael Govan, the director of LACMA offered to buy MOCA after the BCAM debacle, I’m not surprised that Broad rebuffed the overture. Whew, I swear I feel like I’m writing an intro to “Soap” every time I talk about this…Back to 2013: Yesterday’s L.A. Times Article sent shockwaves through the arts community and the theories were fast and furious. THE MORE THINGS CHANGE THE MORE THEY STAY THE SAME- Another Trip Back in Time! Of course a merger of this nature does one of two things: 1. Eliminates the redundancy and competition for precious patrons/ visitors and their endowments and admission fees, and allows the new institution to gain a larger market share. 2. Creates operational efficiencies necessary for either institution to weather tough economic times. I’m really oversimplifying things but when I look at what’s happened to MOCA in the last 9 months (culling of curatorial, educational, design and public relations staff, a focus on it’s stellar permanent collection, and a reliance on Jeffrey Dietch to do double duty as a Director and Curator), while they were attempting to establish some fiscal normalcy, I now see that they’ve culled and packaged themselves quite nicely for the taking. 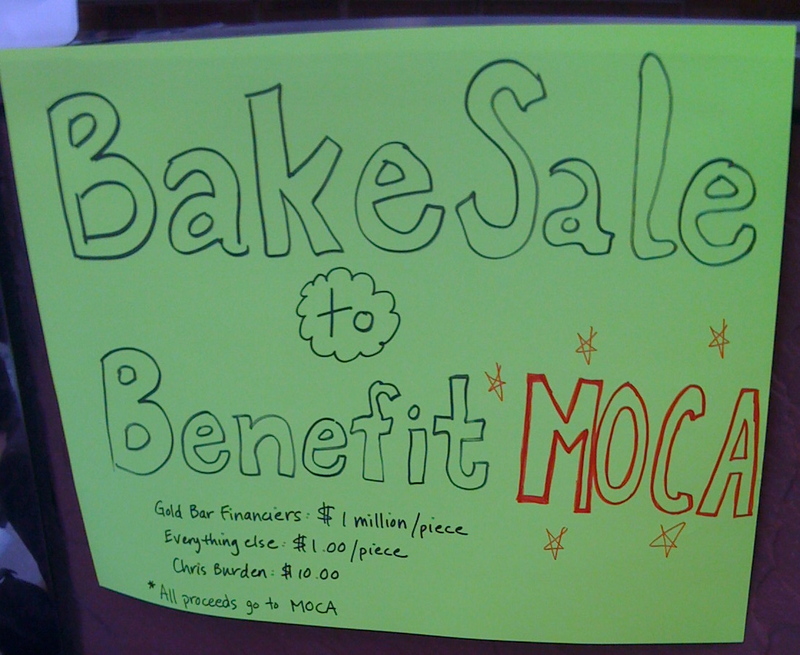 I couldn’t help but think about this bake sale from 2008 when MOCA was in dire straights and I asked myself, “what’s changed at MOCA?” Lots. What’s changed for the better? Not much. What hasn’t changed? MOCA has suddenly found itself without fingers to point and it’s leadership is now forced to look itself in the mirror. Another disruptive event is due within the leadership ranks. MOCA is no longer what we “wish” it could be, an institution as MOCA Mobilization noted in 2008, that “has attracted the admiration of internationally renowned artists and patrons of the arts. It is one of Los Angeles’s great cultural institutions”. A big part of that equation is missing, and the Mobilization group is placing the responsibility square on the shoulders of Eli Broad and a board of trustees who have fallen short of their fiscal responsibilities. The one person holding the cards in MOCA’s fate is Mr. Broad. According to the L.A. Times, when he bailed out the museum in 2008 he won a stipulation that “MOCA could not be acquired for 10 years by ‘any museum located within 100 miles of MOCA’s Grand Avenue facility,’excluding ‘educational institutions or museums affiliated with educational institutions’.” This stipulation opened the doors for the USC acquisition talks (and presumably shut down Govan), so I can’t help but wonder what’s up Broad’s sleeve here. Does he view the LACMA offer as hostile? Is USC primed to swoop in as the White Knight and re-engage MOCA in negotiations? Here’s another wise observation from the book: ” Sometimes you walk away so that you can have a second shot down the line to return. That’s something to remember when your loss stings the most. There will be another day, and as long as you stay on the hunt it will bring its own opportunities.” Wow, just let that settle in for a second! I think Michael Govan studied this book. “I don’t recommend bowing out of something unless you’re becoming an obstacle to the very cause you want to support”. As much as I would like things to stay the same at MOCA (as far as it’s curatorial integrity and depth of it’s collection), I am convinced that for MOCA, a radical change is overdue and in reading the tea leaves it looks like that’s happening. Previous Previous post: (Bay) Lights, Camera, Action!